Is the Parker Solar Probe's semimajor axis being so close to that of Mercury's just coincidence? Does it help somehow? Parker Solar Probe will end up in it's Sun-kissing orbit though a series of Venus flyby's, which roughly pins Parker's aphelion at Venus's semimajor axis or about 108 million km. Its final perihelion will be about 6.6 million km, making its semimajor axis 114.6/2 or about 57.3 million km. Mercury's semimajor axis is about 57.9 million km! 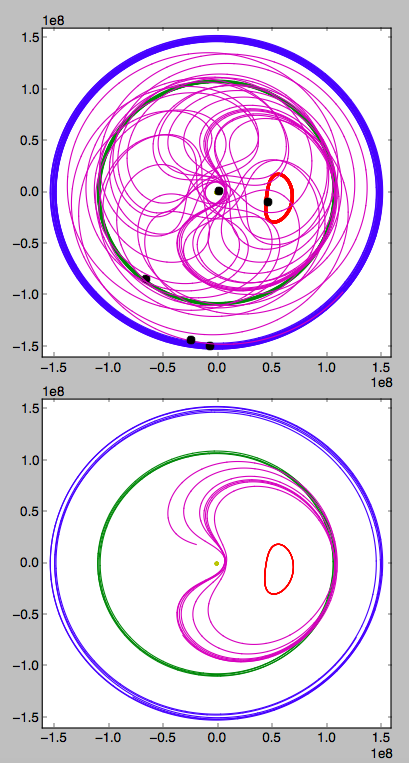 Is this just a manefestation of Bode's law (humorous reference to serendipity) or will it in any way be helpful to stabilize Parker's orbit, or be unhelpful? fyi Horizons now has a projected orbit for Parker that goes out to 2025-Aug-31 so I've plotted the Sun, Mercury, Venus, Earth, and Parker in a frame rotating steadily with Mercury's period. You can see Mercury's actual path is a big loop because it's quite elliptical. The upper plot starts just after launch on 2018-Aug-13 and the dots are today's positions: 2018-Aug-30. The lower plot stars 2024-Jan-01 and you can see that it moves into what has the appearance of a resonant orbit with Venus. It may not really be resonant if there's no gravitational effect doing this, coincident parallel motion is not a true physical resonance, which happens when there is a causative exchange of energy. It can be verified that those three or four very tight, repeating orbits begin in November 2024 after the last Venus flyby. Browse other questions tagged orbital-mechanics physics parker-solar-probe orbital-resonance or ask your own question. How exactly to use astroquery.jplhorizons to get the state vectors of Mercury and the Parker Solar Probe? Will or could the Parker Solar Probe do science at Venus? How can the Parker Solar Probe survive passing within 4 million miles of the sun's surface? How does the Parker Solar Probe's heat shield protect it from dust near the sun? How large are the various forces and torques that the Parker Solar Probe will experience during its closest flyby of the Sun? What is the material and reflectivity of the surface of Parker Solar Probe's heat shield that faces the Sun? How does the Parker Solar Probe have such a wide launch window? What will happen to Parker Solar Probe in the long term? Could we possibly see the shadow offset from Parker Solar probe on Earth? How will the Parker Solar Probe's data transmission keep up with data gathering? At what distance to the sun would parker solar probe completely fail?